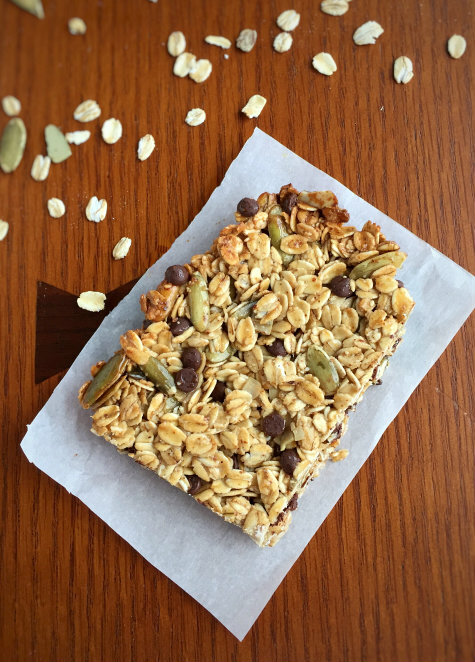 Finding an affordable, healthy AND tasty snack bar at the grocery store can be a difficult task. The cheaper bars are full of all kinds of funky ingredients, and the better ones cost about three to four dollars a bar. Even though these aren’t something that I eat all the time, paying three dollars for one bar isn’t something I like doing. Nuts and seeds contain several enzyme inhibitors, which can put a strain on our digestive mechanism if consumed in excess. Nuts are easier to digest, and their nutrients are more readily available if they are first soaked in salt water overnight, then dried in a warm oven or dehydrator. Soaking them in salt water activates enzymes which neutralize the enzyme inhibitors. The Aztec people did this with pumpkin seeds and squash seeds, which were then eaten whole or ground into meal. Here’s a link to a tutorial on how to soak and dehydrate pumpkin seeds. For this recipe, you can cut the amount of seeds in half, as well as the amount of sea salt. You can omit the cayenne pepper or leave it in if you want. I chose to omit the cayenne in this case. You’ll only need a half cup of seeds, so you’ll have some leftover. Store them in the fridge, and you can eat the rest as a snack or as a garnish on top of a soup or salad. I’ve gotten raw pumpkin seeds at Trader Joe’s and at Kroger. At Trader Joe’s, you can find them with the nuts, and in the Organic food section at Kroger. The mini chocolate chips that I recommend are the Enjoy Life brand. They are certified non-gmo, gluten-free, dairy-free, soy-free and nut-free. Although oats themselves are gluten-free, they may get contaminated with gluten if they are processed on the same equipment used in processing grains with gluten. If you have celiac or just want to avoid gluten like me, buy a package of oats that has certified gluten-free on the label. I purchased Bob’s Red Mill gluten-free oats. You want the old-fashioned oats for this recipe, NOT the quick cooking kind. 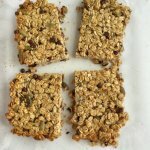 *One of the most important steps in making these bars is to pack the mixture as tightly as possible into the baking pan. This will help to make sure that the slices stay together when cut. You can use either your spatula to do this or place another sheet of parchment paper over it and press down really good. If you do have any crumbles, you can save those and mix them into some yogurt for a different kind of snack. 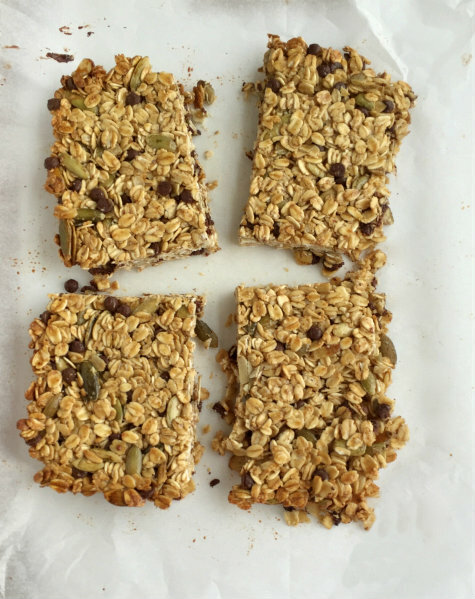 These Oatmeal Pumpkin Seed Chocolate Energy Bars make a healthy snack or portable breakfast! Preheat oven to 350° F. Place a sheet of parchment paper into an 8x8 baking dish with the extra paper hanging over the sides. In a small sauce pan over medium low heat, combine the honey, coconut oil and almond butter. Let cook until it just begins to bubble, then remove from heat. In a large bowl, mix together the sea salt, oats and pumpkin seeds. Pour the honey mixture over the oat mixture and stir with a spatula to combine. Add the chocolate chips, then gently stir to combine. Pour the mixture into the prepared baking dish. Using either a spatula or another sheet of parchment paper on top of the mixture, press down firmly over the entire surface. Place into your preheated oven and bake until light golden brown, about 20-25 minutes. Place baking pan onto a cooling rack and let cool completely before cutting. By Tempie at February 23, 2018 .